Flexible, streamlined and rugged, the PASsport is a 24 hour / 7day recording station that seamlessly connects to a UNIX or NT server/ workstation, creating an automated solution for the entire network. 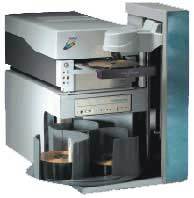 The PASsport is a 120 disc robotic autoloader available with either one CD-R or one CD-R/DVD-R combo drive. A thermal label printer is included. Controlled by PowerCD Studio or PowerDVD Studio, the PASsport automates CD-R and/or DVD-R production, allowing up to 120 discs to be created and labeled without manual intervention. Power 100-240VAC, 60/50 Hz, 2.2-0.82 Amp.